Serious performance at an affordable price - you'd be crazy not to give them a listen. Excellent modern sound. Great value. Good bass extension in F7. German monitor company Adam is one of the world's top speaker designers, best known for its bespoke 'ART' ribbon tweeters and bespoke price. However, it has always embraced the more affordable end of the market, initially with the P Series and then A and AX Series monitors. The new F Series offers the best value yet, combining many of the benefits of the AX in a new, cheaper package. "The new F Series offers the best value yet, combining many of the benefits of the AX in a new, cheaper package"
As you'll have guessed, the F5 and F7 use 5- and 7-inch woofers respectively. These are a new design combining glass fibre and a paper backing. Meanwhile the tweeters use Adam's X-ART design, and at roughly 3-square inches are slightly smaller in size than the AX tweeters. The monitors are assembled in China but the tweeters are still made in Germany. Onboard amplification is Class AB, with twin amps delivering 25 Watts a piece for the F5 and 40 Watts plus 60 Watts for the F7 (tweeter and woofer respectively). By way of comparison the AX uses one Class AB and one Class D amp. Both models include the same rear panel controls, which are two +/- 6dB shelving EQs at 300Hz and 5kHz and a volume control (-inf to +6dB). There's also an 80Hz high pass filter designed primarily for using with the optional F-Sub. Inputs are via either a phono or combination jack/XLR, and there are no front panel controls, although you do get twin LEDs on the logo to indicate active (green) and standby (red). The F-Series enter a signal sensing standby mode when no input signal is present for 20 minutes or longer. As you may have spotted the Fs use a front-facing reflex port, aiding near wall use, and the port aperture is nice and broad to help reduce port noise. Finally the F series can be wall mounted using the bespoke Adam brackets and rear panel screw holes. Out of the box these look and feel well made. Admittedly, there's nothing particularly groundbreaking in the cabinetry (MDF is the main material), and aside from some chamfering on the front panel things are pretty regular. Even so, this means you can sit them on their sides if desired, which can come in handy if you're using a desk. Hook up is pretty straightforward, although there's very little advice in the manual about how to use the EQ controls. This is in stark contrast to the newest Genelecs for example, where the options are both descriptive and prescriptive. "Once you fire up these monitors, they immediately sound just as you would expect"
However, maybe Adam already knows this is a side show, as once you fire up these monitors, they immediately sound just as you would expect. Open in the top end with plenty of upper mid detail, solid in the low mid and mid range and reasonably well balanced at the bottom. In essence the out of the box sound is incredibly well tailored for both monitors. Even so as you would expect, there are differences between the F5 and F7. In general terms, the F7 sounds more expansive and engrossing, while the F5 is a bit more precise, particularly in the mid range. At the bottom, the F7 extension is much better, and on club music maybe a bit too bouncy. We tamed this slightly with a tiny tweak to the low frequency EQ. Overall, the F5 feels lighter in the low end, and a small EQ boost can help here, but the overall balance of the speaker is great as it is, so we kept tweaks to a minimum. The F5 is surprisingly capable at higher levels, but runs out of steam way earlier than the F7, which can go very loud. As is often the case, unless your room is exceptionally well treated acoustically, high levels reveal more limitations of the room than the monitor. It's often said that ribbon tweeters result in a narrower horizontal sweet spot. This isn't massively obvious here, and if you're working on a DAW sat in the middle we really can't see it as a problem. One other thing to note is they're not magnetically shielded, although neither are the AXs for that matter and this only comes as an option for the top end S Series. Next up, although the F Series finish is very good, they don't look or feel quite as lush as their more expensive models. Understandable we think, and certainly not something that would scare us away. 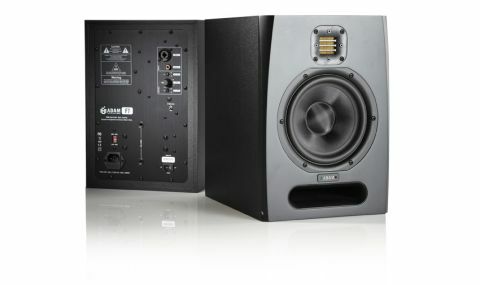 Studio monitors vary considerably in their sound, and one learns to adapt accordingly. But to me the F Series sound exactly as a monitor should, straight out of the box. Obviously there are differences in the delivery between the F5 and F7, most noticeably in the bottom end, but careful design means both models still retain a very consistent colour. On balance we prefer the F7, mostly because the scale of the delivery is bigger and they sound more capable at high levels. Even so, the F5 would be great for smaller rooms, and although we didn't test the F-Sub, adding that to the set-up should work very well. By shaving things here and there from its more expensive monitor designs, Adam has managed to deliver a genuinely budget speaker with totally non budget sound. Don't be suspicious, these are truly excellent monitors for the money and without question should be on your audition list.